There's nothing like a good book to help set the scene for an upcoming adventure or offer destination details. Spend time studying about birds and mammals before you go, dream about all that you'll see and get excited about the local culture, traditions, wildlife and history of Alaska. Some of these books and field guides that are listed below are the same ones that we carry in our tour vehicles. If you would like to order one of these books, click on links below. We have partnered with Longitude Books and you can order the books through this site. This beloved book, leisurely and richly detailed, captures the 19th-century romance with wild places. It includes an account of John Muir's discovery of Glacier Bay. Originally published in 1915. An alphabetical list of geographic names that have been or currently are used for places and features of the Alaska landscape.Information for each name includes its origin and history as well as variant spellings and names. This is a PDF version of the publication by Donald J. Orth published as Geological Survey Professional Paper 567, 1967, reprinted in 1971. Note: this is a large file (68M) and will take some time to load. A profusely illustrated overview of the region, this travel guide features concise essays by well regarded authors on nature, history, peoples and culture. With hundreds of photos and maps, and some limited practical information. From whitewater rafting to dog sledding, sightseeing and hiking, this comprehensive guidebook is an excellent overview of the places, culture and nature of Alaska and the Yukon. With color photographs, maps and illustrations. A fold-up, laminated card featuring color drawings and short descriptions of commonly encountered birds, mammals and reptiles of Alaska. We also carry Alaska Birds. A handsome photographic overview of Alaskan birds, illustrating all 443 species. Good reading and informative, this book is better as a general introduction than as a field guide. The National Geographic Guide to Birds of North America, featuring color paintings and excellent range maps, is easier to use in the field. This clearly presented field guide to mammals, birds, seashore life, fish, trees, shrubs and wildflowers features 300 color illustrations. With a checklist and brief overview of natural history. From the introduction: This book was written, and arranged by color, with the amateur botanist in mind. Through the author's own experience in learning the wildflowers of Alaska, and through teaching classes on Wildflower Identification in the Anchorage Community Schools program, she has discovered this system to be the most useful to the average person. Color is the first characteristic that we notice when looking at a plant. A sturdy, spiral-bound field guide with range maps, color plates and brief text, including an introduction to whales and seals. Designed for use in the field, the book features large color photographs, profiles and helpful drawings. Third edition. Designed for the roadside traveler, this series explains in detail the geologic history of Alaska as seen through the window. Though there are few roads in Southeast Alaska, the book treats the Inside Passage as part of Alaska's "marine highway" ferry system, and is a great introduction to basic geomorphology and how the dramatic landscapes were formed. Features black-and-white photographs complementing the amazingly detailed geologic maps. 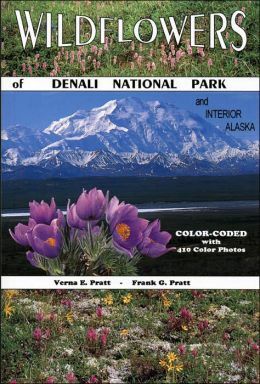 The flowers found in Denali National Park and Preserve are organized according to their colors in this book, and each section is color-coded. For example, pink flowers are together, yellow flowers are together, and white and cream flowers are together. Following the descriptions of the various flowers is an exhaustive list of plants the authors found in the park; it is organized geographically, beginning with the park's entrance and leading to many rivers, mountains, and even lodges in the park. The book concludes with a list of poisonous plants and a glossary of plant terms. With detailed descriptions, hiking maps, photo tips and details on hikes, treks, camping and exploring Denali. "Get off the bus!" is the author's best advice for your visit to Denali National Park. 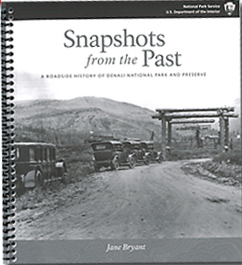 Over 240 rarely seen historic photographs show sites rich in history along the Denali Park road. Arranged to follow the park road from the entrance to Kantishna, 92 miles to the west, this book shares little known stories about the sites and the people of the pioneer park, providing the persepective of decades. The spiral binding allows for folding the book flat to compare historic photos with the current landscape. Along Alaskan Trails, Adventures in Sled Dog History, by Helen Hegener, is a collection of true stories about Alaskan sled dogs and the role they played in the development of the north, with dozens of historic photos from the archives of the Alaska State Library, the University of Alaska Fairbanks, and other sources. 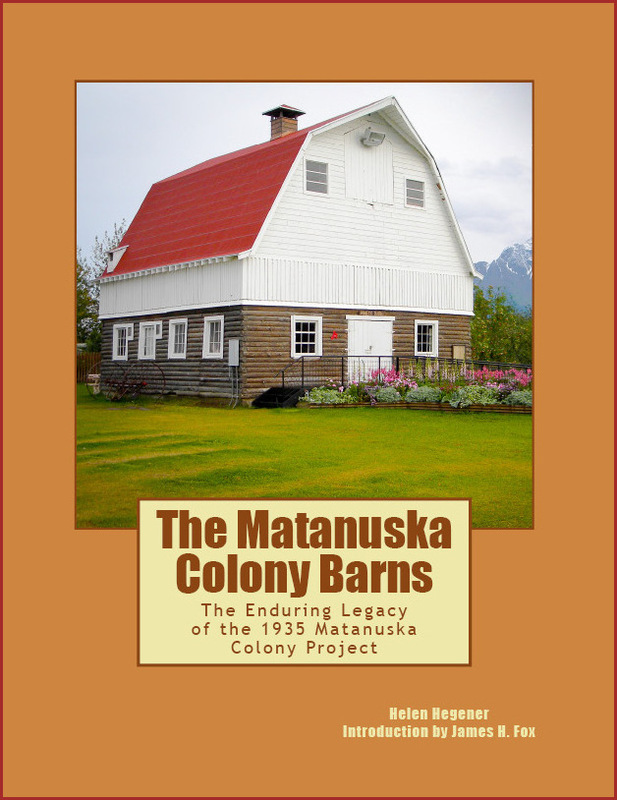 The Matanuska Colony Barns: The Enduring Legacy of the 1935 Matanuska Colony Project, by Helen Hegener. Anyone who travels through the eastern part of Alaska’s dramatically beautiful Matanuska Valley soon finds a Colony barn enhancing the landscape. These striking Valley landmarks are the enduring legacy of an all-but-forgotten chapter in American history, when the U.S. government took a direct hand in the lives of thousands of its citizens, offering Depression-distraught farm families an opportunity to begin again in a far-off land with government financing and support. This book includes Colonist families listing, maps, bibliography, resources, index. Denali is alive, pulsing with life and the timeless ebb and flow of the seasons. Here in Alaska's interior lies a vast and wild landscape. Six million acres - nearly three times the size of Yellowstone - Denali National Park and Preserve is a refuge for all that live here and all that travel through. 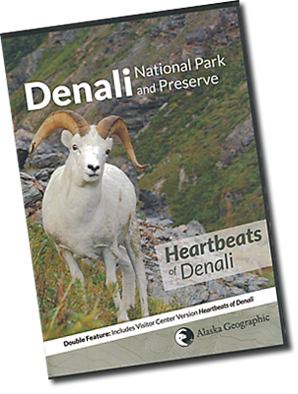 Heartbeats of Denali was named the winner in the 2006 audio/visual category media awards from the Association of Partners for Public Lands and is featured at the Denali Visitor Center.